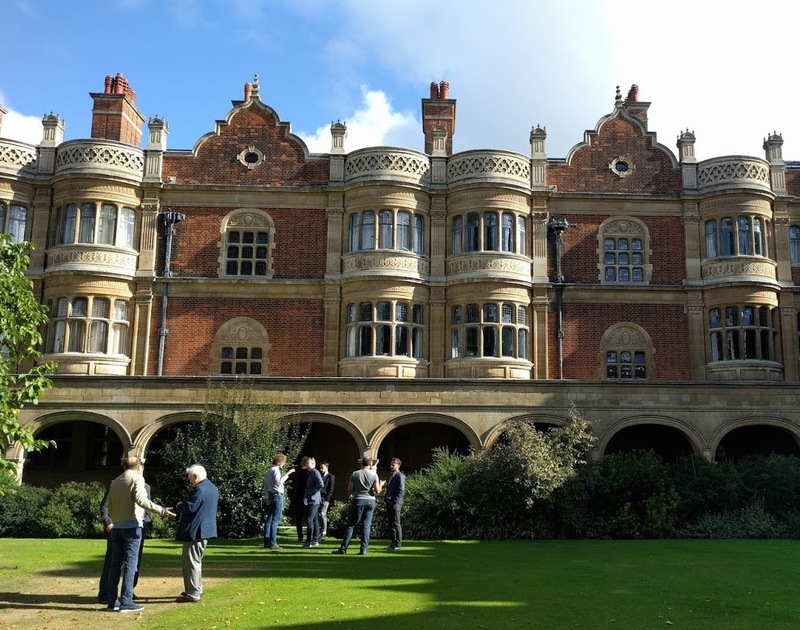 An international seminar on strategy games was held at Cambridge University, England, on October 1st and 2nd. Organized by ChessPlus, and co-sponsored by Google’s Deepmind, the event drew about 40 teachers from 15 countries, who shared their expertise on teaching go, chess and other games in schools. The first day began with a compelling presentation from Dr. Barry Hymer, Professor of Psychology in Education at the University of Cumbria, in Lancaster. Hymer provided a brief introduction to mindset theory, and what it does and doesn’t say about achievement as it relates to strategy games. 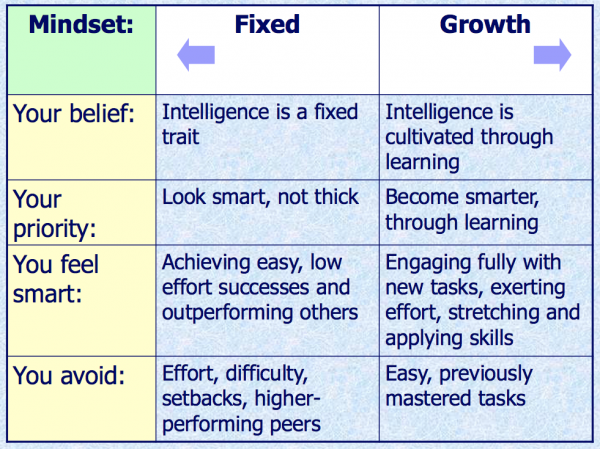 He contrasted two different mindsets: fixed vs. growth. Those with the former believe intelligence is a fixed trait that can’t be changed, while those with the latter believe intelligence is cultivated through learning. Dr. Hymer’s chart (below, at right) shows how these mindsets play out. All of us exhibit some of both types of mindsets at times, and in different areas. Hymer also expounded on some mindset myths, which included the belief that natural ability and talent don’t exist, or that they don’t matter, and that hard work guarantees ultimate success. Instead, multiple factors come into play to create success, including what Hymer calls metacognitive strategies (how we think about thinking). Hymer noted Gary Kasparov, from the chess world, felt the same way: “It’s not enough to work hard and study late into the night. You must also become intimately aware of the methods you use to reach your decisions.” In a later presentation, Hymer discussed some educational studies with a few surprising results, including that praising students does not lead to any greater level of excellence or even motivation. Negative feedback also does not help. Instead, Hymer advocates engaged, attentive, and non-judgmental feedback, which he said helps create self-motivated students who then cultivate the love of learning for themselves. These types of students outperform all other categories by as much as 30%, said Hymer. An example of this from the go community would be the kinds of questions one asks in a teaching game: “What were you hoping to achieve when you went here? How do you think your opponent might respond? Were there other places you thought of playing, and why?” Getting a student to think about how they reached their decisions is key to creating autonomous learners in Hymer’s approach. The main organizers were John Foley, Stefan Löffler, Rita Atkins and John Upham from Chessplus. 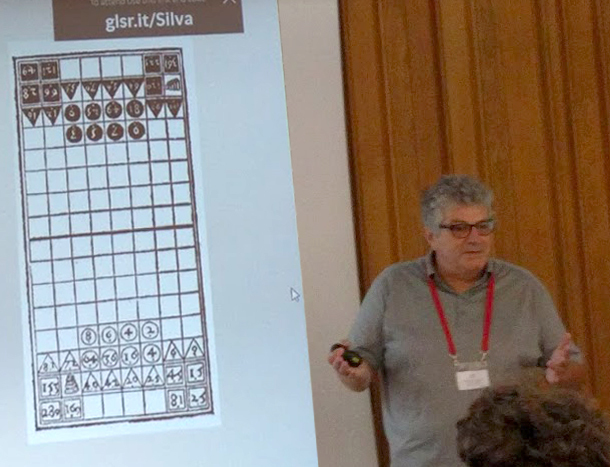 The seminar was sponsored by DeepMind, and supported by the British Go Association, the European Go Federation, the European Go Cultural Centre, the American Go Foundation and the UK Backgammon Federation. An online documentation of the seminar, including videos, photos and presentation files is planned. Interested readers can see the program, and associated slideshows, for all segments highlighted in blue on this page. -Story and photos by Paul Barchilon, E-J Youth Editor. 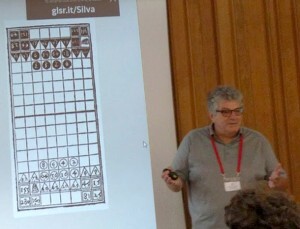 Top: Seminar participants take a break on the lawn at Sidney Sussex College, Cambridge; Lower right: Slide from Dr. Barry Hymer’s presentation; Lower left: Professor Jorge Nuno Silva shows the board for Rythmomachia.